Escherichia coli has been explored as a platform host strain for biofuels production such as butanol. However, the severe toxicity of butanol is considered to be one major limitation for butanol production from E. coli. The goal of this study is therefore to construct butanol-tolerant E. coli strains and clarify the tolerance mechanisms. A recombinant E. coli strain harboring σ70 mutation capable of tolerating 2 % (v/v) butanol was isolated by the global transcription machinery engineering (gTME) approach. DNA microarrays were employed to assess the transcriptome profile of butanol-tolerant strain B8. Compared with the wild-type strain, 329 differentially expressed genes (197 up-regulated and 132 down-regulated) (p < 0.05; FC ≥ 2) were identified. These genes are involved in carbohydrate metabolism, energy metabolism, two-component signal transduction system, oxidative stress response, lipid and cell envelope biogenesis and efflux pump. Several membrane-related proteins were proved to be involved in butanol tolerance of E. coli. Two down-regulated genes, yibT and yghW, were identified to be capable of affecting butanol tolerance by regulating membrane fatty acid composition. Another down-regulated gene ybjC encodes a predicted inner membrane protein. In addition, a number of up-regulated genes, such as gcl and glcF, contribute to supplement metabolic intermediates for glyoxylate and TCA cycles to enhance energy supply. Our results could serve as a practical strategy for the construction of platform E. coli strains as biofuel producer. Concerns on global energy crisis and environmental problems have prompted the development of renewable biofuels as potential alternatives for replacing traditional fossil fuels. Among biofuels, butanol has attracted much attention due to its higher energy density, miscibility with gasoline and lower corrosivity . Escherichia coli, as an important platform microorganism, has been widely engineered as an alternative host for the production of various biofuels due to its advantages of fast growth and easy genetic manipulation [2, 3]. However, most biofuels are toxic to E. coli, which barely tolerate organic solvents with LogP values lower than 3.4–3.8 . For example, cell growth of E. coli is completely inhibited in the presence of 1 % (v/v) n-butanol . The poor butanol tolerance of E. coli has been a major limitation in the development of butanol-producing strains. Therefore, it is urgently necessary to improve the butanol tolerance of E. coli. Most industrial biofuel-producing strains were obtained through solvent stress adaptation, genetic and metabolic engineering and traditional mutagenesis [6–9]. However, long-term adaptive evolution and traditional mutagenesis are often time-consuming. Significantly improved microbial tolerance requires a complex and multigenic phenotype. With recent development of direct mapping between the transcriptome and phenotype, strain improvement efforts have been focused on the manipulation of transcription factors. Global transcription machinery engineering (gTME) emerged as a promising strategy and has been widely used to evolve the desired phenotypes in recent years [10, 11]. Several transcription factors, including sigma factor, CRP, Spt15, H-NS and Hha, have been successfully engineered to improve organic solvent tolerance of various microbial strains [12–15]. σ70 is a subunit of RNA polymerase encoded by rpoD, which regulates over 1000 genes in E. coli. Studies showed that σ70 mutations could alter the promoter preferences of RNA polymerase and therefore affect transcriptome at a global level [16–18]. Our group previously isolated an E. coli harboring σ70 mutant C9, which could grow in the presence of 69 % (v/v) of cyclohexane . Many solvent tolerance-related genes and their mechanisms have been reported in E. coli strains. MarA (encoded by marA) was confirmed to be a transcription factor capable of inducing the expression of mar-sox regulon genes [20, 21]. Disruption of proV and marR genes could increase the n-hexane tolerance of E. coli cells, possibly due to their function in regulation of osmotic pressure . Rutherford and coworkers reported that n-butanol stress response genes are also involved in other stress responses, such as oxidative stress (sodA, sodC and yqhD), heat shock and cell envelope stress (rpoE, clpB, htpG, cpxR and cpxP) . In our previous study, E. coli strain overexpressing mmsB (encoding 3-hydroxyisobutyrate dehydrogenase) exhibited high solvent tolerance by generating more energy to pump out intracellular organic solvent . These studies demonstrate the complexity and diversity of solvent tolerance mechanisms in E. coli. It has been reported that E. coli strain capable of growing in the presence of 1.2 % (v/v) butanol was obtained by engineering the global transcription factor cyclic AMP receptor protein . Recently, n-butanol tolerance of E. coli was expanded to 2 % (v/v) by engineering an artificial transcription factor combining with controlling membrane-related functions . In this work, we aimed to improve the butanol tolerance of E. coli by a feasible and efficient approach gTME and understand the mechanism between rpoD mutagenesis and the evolved phenotype. An E. coli strain carrying σ70 mutant capable of tolerating as high as 2 % (v/v) butanol was isolated, which is close to the highest butanol tolerance level of E. coli reported so far. DNA microarrays were employed to identify critical genes related to the n-butanol tolerance based on the transcriptome profile of mutant B8 compared with its wild type (WT). Several membrane-related genes (such as yibT, yghW and ybjC) were recognized to affect membrane fatty acid composition or function as a membrane protein. Other genes (such as gcl and glcF) involved in enhancing metabolic intermediates levels for glyoxylate and TCA cycles were also identified. To obtain σ70 mutants with high n-butanol tolerance, random mutagenesis was performed to construct a rpoD mutant library of around 106. In the first round of screening, 483 mutants were selected from the mutagenesis library on agar plate containing 0.5 % (v/v) butanol. They were further inoculated into 24-well plate under butanol pressure. Among them, ten mutants with OD660 of 1.3–2.0 were selected due to their advantageous growth under 0.5 % (v/v) butanol than other mutants (OD660 < 1) (Fig. 1a). Then these mutants were cultured in medium containing 0.5–1.5 % (v/v) n-butanol (0.1 % gradient increasing). One mutant exhibited the highest tolerance (0.76 OD660) at 1.2 % (v/v) n-butanol and was designated as D3, which was confirmed with two amino acid substitutions (I41L, P97Q). To further improve the butanol tolerance, the second round of random mutagenesis was performed to construct a variant library using D3 as a template. In the second round of screening, eight mutants exhibited higher butanol tolerance (OD660 > 2.0) than others (Fig. 1b). In further screening under 0.5–1.5 % (v/v) butanol (0.1 % gradient increasing), one mutant B8 with three substitutions (I41L, E57D, P97Q) exhibited excellent growth in the presence of 1.2 % (v/v) butanol, reaching 1.432 OD660 compared with 0.778 of D3 and 0.247 of WT (Additional file 1: Figure S1). Then, mutants B8, D3 and WT were further cultured under higher n-butanol concentration (1.2–2.2 %) to assess their maximum butanol tolerance (Fig. 2a). The cell growth of WT was completely inhibited when butanol reached over 1.2 % (v/v), and mutant D3 could hardly grow in the presence of 1.6 % (v/v) butanol. Nevertheless, for mutant B8, OD660 reached 0.372 after 8 h incubation with 2.0 % (v/v) butanol, suggesting a much higher butanol tolerance than D3 and WT, while no cell growth was observed for B8 at over 2.0 % (v/v) n-butanol. Finally, B8 was selected as the best candidate for further study. To further characterize the tolerance of B8, solvent shock experiments were performed in medium containing higher concentration of n-butanol. As shown in Fig. 2b, the growth of B8 and WT has no significant difference in the absence of butanol. After treatment with 3 % (v/v) butanol, WT showed growth only at tenfold dilution, while B8 could grow well at 103-fold dilution on LB agar plate, indicating B8 has significantly higher butanol tolerance than WT. The cell morphology of microorganisms can adapt to the environmental changes . Both WT and B8 grew in the absence or presence of butanol. In transmission electron microscope observation (Fig. 3), mutant B8 cells were significantly longer than WT cells after butanol treatment. In the absence of n-butanol, the cell size was (1.72 ± 0.17) × 0.73 μm for WT (Fig. 3a) and (1.89 ± 0.22) × 0.87 μm for B8 (Fig. 3c), respectively. After 0.8 % (v/v) n-butanol treatment, the cell size of WT and B8 shifted to (2.18 ± 0.25) × 0.53 μm (Fig. 3b) and (2.94 ± 0.39) × 0.52 μm, respectively (Fig. 3d), based on the measurement of around 100 cells. The changes in cell size were confirmed to be statistically significant (p < 0.05). Although the cell morphology was observed based on 100 cells per strain, the cell sizes could also be affected by reasons unrelated to the tolerance effects. Notably, B8 cells were longer than WT when subjected to n-butanol stress. A similar observation on the cell size of ethanol-adapted Saccharomyces cerevisiae has also been reported . Neumann and coworkers reported that the microorganism cells of larger size could be more advantageous over the smaller ones under stress conditions, because the ratio of surface area to volume (S:V = 4πr2:4/3πr3) of larger cells is relatively lower than that of the smaller ones . Similarly, B8 cells with smaller S:V value exhibited greater butanol tolerance than WT. Meanwhile, it was observed that the cytoplasm of B8 shrank in the presence of butanol. Occasionally, invaginated bodies (Fig. 3d) appeared in B8 and the inner membrane of B8 cells was not broken or leaky under butanol treatment. The huddling cytoplasm in the inner membrane could be a self-protection mechanism which protects the cells from damage due to the solvent . Aono and coworkers also reported a similar phenomenon in E. coli cell membrane or cytoplasm in the presence of n-hexane or cyclohexane . Overall, butanol-tolerant mutant B8 demonstrated a stronger stress response capability. Our results suggest that microbial cells could adapt to solvent stress via morphology change. Organic solvent tolerance-related genes are usually correlated in a precise regulatory network. The global gene expression profile of mutant B8 and WT was analyzed by DNA microarray. Data were analyzed by Gene Spring Software (Santa Clara, CA, USA) to identify differentially expressed genes. For correlation of gene expression difference under solvent challenge, an over twofold change in gene expression was required with a p value <0.05 . The results show that 329 genes (including 197 up-regulated and 132 down-regulated) exhibited differential expression (p < 0.05; FC ≥ 2) between B8 and WT under 0.8 % (v/v) butanol stress (Additional file 2: Figure S2). Supporting information on the detailed description of differentially expressed genes is provided in Additional file 3: Table S3. Furthermore, genes showing significant difference in transcription level were selected for clustering analysis, which helps to understand the relationships and discrepancy of samples more comprehensively and intuitively (Additional file 4: Figure S3). The same types of genes were gathered in a cluster with similar biological functions. To identify the function of differentially expressed genes, their biological pathways corresponding to their functional class were summarized by KEGG (Table 1). These genes mainly involve in cell envelope biogenesis, carbohydrate metabolism, energy metabolism, nucleotide metabolism and two-component signal transduction system. As shown in Table 1, most genes (such as ybbQ, glxR, hyi, gcl, glcB, glcD, glcF) involved in glyoxylate and dicarboxylate metabolism pathway were up-regulated for over fivefold, and other genes were also enhanced by more than twofold. The glyoxylate and dicarboxylate metabolism pathway could generate ATP, and its intermediate metabolite NADH could assist in regulating proton gradient and membrane potential. This might be a key factor for improving butanol tolerance, because energy supply is essential for overcoming butanol pressure . In addition, genes related to the ABC transporter pathway were also significantly up-regulated by 2.18- to 5.63-fold. ABC transporter systems consist of different transmembrane protein components and share a common ATP-binding site. ABC transporters play roles in bacterial virulence, cell growth and development, and survival under various environments [33, 34]. Based on our microarray data, ABC transporters annotated as molybdate/arginine/ferric/phosphate type transporters were identified (Table 1), which are responsible for transporting molybdate/arginine/ferric/phosphate substrates across biological membranes. Ferric is important for the regulation of intracellular redox respiratory system, while molybdate/arginine/phosphate substrates are essential for the cellular anabolism and pH homeostasis [35–38]. Therefore, these ABC transporters could affect the adaptation of E. coli strains under severe environments, such as solvent challenge. Many genes have been confirmed to be related to the organic solvent tolerance of the E. coli strain. For example, overexpression of marA could enhance the function of AcrAB-TolC efflux pump, so that the toxic substances could be extruded more efficiently [21, 39]. Escherichia coli mutant △lon (cell envelop related gene) showed enhanced solvent tolerance level . An E. coli mutant with gene disruptions in both proV and marR showed increased solvent tolerance due to their functions in regulation of osmotic pressure . In this study, seven down-regulated genes (yibT, yghW, ymgI, yhcN, yrbL, ECs4086, ybjC) were selected for further study. They were rarely investigated previously and exhibited over sixfold changes in microarray analysis. All seven genes were annotated as predicted protein or hypothetical protein. The down-regulation folds of these genes are 46.72, 13.00, 16.02, 14.74, 14.07, 12.91 and 8.73, respectively. The knockout strains were constructed for further investigation. Among them, △yibT, △yghW and △ybjC exhibited higher n-butanol tolerance, while other knockouts showed similar growth to the control (Fig. 4). So far, there has been no report on the solvent tolerance-related functions of yghW and yibT. It was, however, noticed that these two predicted proteins are closely related to membrane proteins in stitch networks (http://www.stitch.embl.de/). Stitch is a database which contains interaction information for connected proteins and chemicals. It allows querying by genes name and metabolic pathways . In stitch networks, gnsA and gnsB are predicted regulators of phosphatidylethanolamine synthesis and unsaturated fatty acids regulatory proteins, respectively, which are both linked to yibT. Gene yghW is linked to the inner membrane protein encoding genes ybjO and ybjM, as well as genes encoding the predicted lipoprotein or conserved protein in stitch networks. It is therefore presumed that modulation of membrane fatty acid compositions is one possible defense mechanism of yibT and yghW. It has been reported that the properties of membrane fatty acids, such as fatty acid chain length, branching pattern and unsaturation degree of fatty acids, could change when exposed to environment stress [42–45]. In this study, phospholipids of △yghW and △yibT were extracted and analyzed. Our results show that the main components of membrane fatty acids are C16:1, C16:0, C18:0 and C18:1, which account for over 70 % of the total fatty acids in all strains (Table 2) and are responsible for the integrity and fluidity of the membrane . It was noticed that the proportion of unsaturated fatty acid (UFA) in total fatty acids was increased in both knockouts, especially palmitoleic acid (C16:1) and oleic acid (C18:1). Oleic acid (C18:1) has been regarded as the most important UFA in counteracting the toxic effects of the solvent by modulating plasma membrane fluidity . Additionally, palmitoleic acid (C16:1) could influence the rigidity and integrity of membrane lipid bilayer [46, 48]. It is speculated that a higher proportion of oleic acid and palmitoleic acid in △yghW and △yibT contributes to a lower membrane fluidity, higher rigidity and membrane integrity, which might be a compensatory advantage of the membrane challenged by butanol. As a result of changes in membrane fatty acid composition, other physicochemical properties of the membrane, such as proton permeability and lipid–protein interactions could also be affected [49, 50]. Our findings suggest that the butanol tolerance mechanism of △yghW and △yibT are related to membrane fatty acid composition. Moreover, the hydrophobicity, acidity and alkalinity of cell surface are important properties related to the solvent tolerance [51–53]. Using the MATS method, the adsorptions of three strains (△yghW, △yibT and JM109) to organic solvents with different hydrophobicities such as chloroform, hexadecane, ethyl acetate and decane were determined (Additional file 5: Figure S4). Our results show that the adsorptions of △yghW, △yibT and JM109 to chloroform were 1.89-, 1.86- and 1.61-fold of those to hexadecane, indicating that the alkaline strength of the knockout strains was higher than that of WT. The alkaline strength of the cell surface has been reported to be proportional to the adsorption ratio of chloroform adsorption to hexadecane . Similarly, the adsorptions of △yghW, △yibT and JM109 to ethyl acetate were 1.81-, 1.79- and 1.65-fold of those to decane. It has also been reported that the acidity strength of cell surface was proportional to the adsorption ratio of ethyl acetate to decane . It is supposed that the increase of surface acidity and alkalinity is due to the presence of proteins and charged chemical groups on the cell surface, such as PO4 2− and COO− , which may assist strains to counteract extracellular toxic substances. Additionally, the adhesion to hexadecane and decane reflects the hydrophobicity of the cell surface. In Additional file 5: Figure S4, the adhesion of △yghW and △yibT cells to hexadecane and decane was weaker compared with that of the control, suggesting that the surface hydrophobicity of the knockouts was higher than that of the control. The contact angle measurement (CAM) was also conducted to determine the surface hydrophobicity. Our results show that the contact angle of the control, △yghW and △yibT were 21.17 ± 1.78°, 36.25 ± 2.13° and 34.65 ± 2.04°, respectively (Additional file 6: Figure S5). Consistent with the results of MATS, CAM assay represents a higher surface hydrophobicity of △yghW and △yibT. Other studies suggest that the expansion of surface hydrophobic region could promote the interactions between the phospholipids and embedded proteins and bonds between cation and electronegative phospholipids in the membrane [55, 56]. It is therefore rational to conjecture that the cell surface of △yghW and △yibT is less permeable, which could help to prevent the intruding of toxicity compounds. The gene (ybjC) encoding a predicted inner membrane protein was also investigated. To verify the location of YbjC and its tolerance-related mechanism, YbjC–GFP (green fluorescent protein) fusion protein was constructed. As shown in Fig. 5a, a clear fluorescence signal surrounding the membrane region was detected in E. coli cells expressing fusion protein YbjC–GFP. Differently, the entire cells were filled with green fluorescence when GFP was expressed alone (Fig. 5b). Here, a known membrane protein YidC fused with GFP was expressed as the positive control (Fig. 5c), and the microscopy pattern of YbjC–GFP fusion was similar to YidC–GFP. This further suggests that YbjC is a membrane protein. Unfortunately, the function of YidC related to the butanol tolerance mechanism is not clear yet. Gene cluster glc, encoding enzymes involved in glyoxylate and dicarboxylate metabolism, was up-regulated significantly in this study. For example, genes glcF, glcA, glcD, glcG, glcB and gcl were up-regulated by 22.60-, 18.17-, 12.78-, 12.75- 7.86- and 10.60-fold, respectively. The above genes and the glc gene cluster were selected for overexpression to investigate their functional relevance to butanol tolerance. As shown in Additional file 7: Figure S6, glcA overexpression strain could barely grow even without butanol. For glcB, glcD and glcG overexpression strains, similar growth with control strain (JM109 carrying empty plasmid pQE80L) was observed in the presence and absence of butanol. Strains overexpressing glcF and gcl showed improved cell growth compared with the control. Furthermore, glcDEFGBA cluster co-expression strains also exhibited better growth than the control with or without butanol. The possible explanation is that glcA encodes glycolate transporter, and its overexpression could result in metabolism imbalance of carbon source and energy in cells . glcB encodes malate synthase G which is not essential for growth. glcD and glcG encode different subunits of glycolate oxidase, which have no significant effect on the oxidase activity . Gene glcF encodes iron–sulfur subunit of glycolate oxidase that catalyzes the conversion of glycolate to glyoxylate, and gcl encodes glyoxylate carboligase that transforms glyoxylate into phosphoglycerate [59, 60]. One possible explanation is that these two enzymes, glycolate oxidase and glyoxylate carboligase, directly improve the TCA cycle via modulating glyoxylate and pyruvate, which replenish metabolic intermediates for the TCA cycle (Additional file 8: Figure S7). In this study, rpoD mutagenesis approach conduced to enhanced OST phenotype by regulating the expression level of hundreds of genes. Our results also suggest that the co-expression of glc gene cluster is more favorable for cell growth than individual gene overexpression, which might have minor or negative effect on butanol tolerance. To elucidate the possible mechanism, the concentrations of carboxylic acids in TCA cycle were monitored in glcF and gcl overexpression strains. For both strains, pyruvate concentrations were increased in the presence of butanol, whereas higher pyruvate levels were also observed without butanol (Additional file 9: Table S4). Moreover, the fumarate concentration was also increased in the overexpression strains without butanol, but declined slightly when 0.8 % (v/v) butanol was added. This phenomenon may be attributed to the inhibition of certain TCA cycle enzymes (such as succinate dehydrogenase) that are sensitive to the oxidative stress induced by butanol. A similar phenomenon was reported by Fu and coworkers . Although the elevated pyruvate level in gcl and glcF overexpression strains does not seem to be directly related to butanol stress, it is assumed that the up-regulation of these two genes is favorable for the cell growth by replenishing TCA metabolic intermediates. In summary, we successfully isolated an E. coli strain harboring rpoD mutant B8 with 2 % (v/v) butanol tolerance using global transcriptional machinery engineering approach. Based on DNA microarrays results, 329 genes (including 197 up-regulated and 132 down-regulated) showed over twofold difference in the expression level compared with WT after butanol treatment. These genes are mainly involved in the metabolic pathways including ABC pump, ascorbate and aldarate metabolism, energy metabolism, two-component signal transduction system and amino acid metabolism. Tolerance mechanisms of several critical genes have been elucidated. Among them, down-regulated genes yghW and yibT were proved to improve n-butanol tolerance due to their regulatory roles in membrane fatty acids composition. YbjC was confirmed to be a membrane protein, while up-regulated genes gcl and glcF could replenish TCA cycle metabolic intermediates to improve cell growth and metabolism. These results could provide the potential approach for the construction of E. coli strain as a bio-butanol producer. Escherichia coli JM109 was used as the host strain. Gene deletion strains were generated by Red-mediated recombination approach and overexpression strains were generated using pQE80L as an expression vector. Strains and plasmids are listed in Additional file 10: Table S1. Primers used in this study are listed in Additional file 11: Table S2. Plasmid pQE80L was purchased from Qiagen GmbH (Hilden, Germany). pHACM-rpoD WT was presented as a kind gift of Dr. Huimin Yu (Tsinghua University, China). Restriction enzymes and PrimeSTAR®HS DNA Polymerase were purchased from Takara (Tokyo, Japan). The dam-methylated DNA-specific restriction enzyme DpnI was purchased from New England Biolabs (Ipswich, MA, USA). GeneMorph II Random Mutagenesis Kit was obtained from Stratagene (La Jolla, CA, USA). All strains were grown in Luria–Bertani (LB) medium (tryptone 10 g/L, yeast extract 5 g/L, NaCl 10 g/L) at 37 °C, 120 rpm. Butanol was added as specified in each experiment. When necessary, antibiotics chloramphenicol (34 μg/mL), ampicillin (100 μg/mL) and kanamycin (50 μg/mL) were added to the media. For gene overexpression, 0.2 mM IPTG was added to the medium at around 0.3 OD660. Using plasmid pHACM-rpoD WT as the template, random mutagenesis was performed by the GenemorphII Random Mutagenesis kit (Stratagene) with a mutation rate of approximately 4.5–9 mutations/kb. The error-prone PCR program was set as follows: 5 min at 95 °C, 30 cycles of 95 °C for 30 s, 57 °C for 1 min, followed by 72 °C for 2 min, and 10 min at 72 °C. After running the whole plasmid PCR, the PCR product mixture was digested with DpnI and then transformed into E. coli JM109. Escherichia coli transformants were plated on LB agar plates containing 34 μg/mL chloramphenicol and incubated at 37 °C. Then the colonies were scraped off to create a σ70 mutant library for further butanol-tolerant phenotype selection. The total mutant library size was approximately 106. First, 483 colonies were selected from the σ70 mutant library on agar plate containing 0.5 % butanol (v/v). Then, these colonies were inoculated into 24-well plates with LB/Cm liquid medium. Butanol (0.5 %, v/v) was added into the culture when OD660 reached 0.2, and the cells were further incubated for 8 h at 120 rpm and 37 °C. Cell density was measured, and ten mutants with OD660 above 1.0 were selected. Then, the selected mutants were cultured in a medium containing higher concentrations (0.5–1.5 %, v/v) of n-butanol by 0.1 % (v/v) gradient, until a strain exhibiting the highest tolerance was obtained. The plasmid harboring the rpoD mutant was then sequenced and designated as D3. To further improve the n-butanol tolerance, σ70 mutant D3 was used as a template to construct a random mutagenesis library for a second round of screening. The screening method was the same as that in the first round. The best mutant B8 was selected and evaluated under higher n-butanol concentrations (0.1 % gradient increasing from 1.2 to 2.2 %) to determine its maximum tolerant level. The overnight cell culture was inoculated (1 %) into a fresh LB medium. When OD660 reached 0.8, 3 % (v/v) n-butanol was added into the culture. After incubation at 37 °C for 1.5 h, the cultures were serially diluted for 105, 104, 103, 102 and 10-fold with aseptic water. Then, 10 μL of the each diluted culture was spotted onto LB/agar plates and further incubated at 37 °C overnight. The σ70 mutant B8 and WT strains were cultured overnight and inoculated (1 %) into fresh LB/Cm liquid medium for incubation at 37 °C and 120 rpm for 8 h with or without 0.8 % (v/v) n-butanol. The cells were diluted and spread on LB/Cm agar plates. Single colonies were treated as described in the literature and observed using transmission electron microscope . Briefly, single colonies were picked and fixed by immersion in 2.5 % glutaraldehyde at 4 °C for 3 h. The cell suspension was mixed once every half-hour. Then, cells were washed four times with 0.1 M phosphate buffer (pH 7.2), and the samples were diluted for cell morphology observation under Hitachi-H7650 transmission electron microscopy (Japan). The average cellular size of WT and B8 was counted on the electron microscope based on around 100 cells. Escherichia coli strains harboring σ70 mutant B8 and WT were cultured overnight and inoculated (1 %) into fresh medium. n-Butanol (0.8 %, v/v) was added at 0.8 OD660 and further incubated for 1.5 h. Cells were harvested by centrifugation (8800 g, 4 °C). Total RNA was extracted using Qiagen RNeasy kit (Hilden, Germany) following the manufacturer’s instructions. Qualified total RNA was further purified by Qiagen RNeasy mini kit and RNase-Free DNase Set. Three biological replicates of RNA samples were stored in dry ice and subjected to further DNA microarray analysis. The microarray service was provided by Shanghai Biotechnology Co., Ltd. (Shanghai, China) using Agilent SurePrint E. coli 8 × 15 K slides, and the quality and integrity of RNA were examined before analysis. Slides were scanned by Agilent Microarray Scanner (Santa Clara, CA, USA), and data were extracted with Agilent Feature Extraction software 10.7. Raw data were normalized by Quantile algorithm, Gene Spring Software 11.0 (Santa Clara, CA, USA). Differentially expressed genes were identified using the rank product method . The MeV (TM4) software was used for clustering and other expression profile analysis . The related metabolic pathway of differentially expressed genes was analyzed using Kyoto Encyclopedia of Gene and Genomics (KEGG) database . The microarray data have been deposited at the gene expression omnibus (GEO) under the accession number GSE79305. Gene knockout (for down-regulated genes) and overexpression (for up-regulated genes) strains were constructed based on the microarrays results. Spot assay as a tolerance confirmation method was conducted for knockout strains. 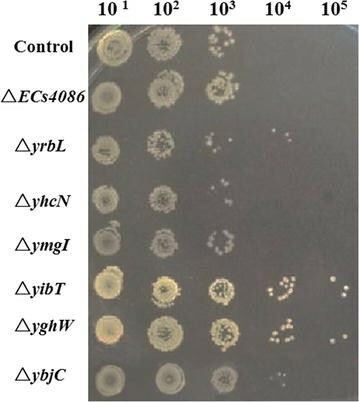 n-Butanol (0.8 %, v/v) was added when the cell density reached 0.8 OD660, then the cells were further cultured for 1.5 h. Cell culture was serially diluted at a tenfold gradient, and 10 μL of the diluted culture was spotted onto LB/agar plates for incubation at 37 °C overnight. For overexpression strains, the overnight culture was inoculated (1 %) into fresh medium and cultured at 37 °C and 120 rpm, and 0.2 mM IPTG was added when OD660 reached 0.3. Then, 0.8 % (v/v) butanol was added at 0.8 OD660 for further incubation at 30 °C for 8 h. The growth of the strains was monitored by measuring cell density at OD660. Lipid extraction was performed as described by Bligh . Briefly, the stationary phase cells of E. coli JM109, △yibT and △yghW were collected by centrifugation and washed with 10 mM, pH 7.4 sodium phosphate buffer. The cell pellets (0.3 g wet weight) were suspended in a mixture consisting of buffer, methanol and chloroform in the proportion of 0.8:2:1 (v/v) and incubated at room temperature for 2 h, with brief shaking every half-hour. Then, the extract was centrifuged at 4 °C after diluting with methanol and chloroform (1:1, v/v). The lower chloroform phase (containing lipids) was added into the methanol solution containing 5 % (v/v) H2SO4. After 2 h of methylation at 70 °C, the mixture was cooled to room temperature and extracted three times with pentane. Then, the samples were air dried to remove pentane. Finally, the samples were reconstituted with n-hexane for GC–MS analysis. MATS (microbial adhesion to solvents) analysis was performed following the MATH method developed by Bellon-Fontaine with slight modification [53, 65]. Briefly, the strains were cultured in LB medium, and butanol (0.8 %, v/v) was added when OD660 reached 0.8. Cells were further incubated for 12 h at 37 °C and were collected by centrifugation (8800 g and 10 min at 4 °C), then washed with 100 mM, pH 6.0 potassium phosphate buffer and centrifuged again. The cell concentration was then adjusted to around 1.0 OD400 (A0) using the same potassium phosphate buffer. The cell suspension (4.8 mL) was mixed with 0.8 mL of chloroform, hexadecane, ethyl acetate and decane, respectively. The two-phase mixture was mixed by vortexing for 90 s and then incubated statically at room temperature for 15 min. The aqueous phase was removed and OD400 was measured (A) to calculate the adhesion ratio [Adhesion % = (1 − A/A0) × 100 %]. The above experiment was repeated for three times. Contact angle measurements (CAM) was performed to measure the surface hydrophobicity . Briefly, strains were cultured in the LB medium, and butanol (0.8 %, v/v) was added when OD660 reached 0.8. Cells were further incubated for 12 h at 37 °C and were collected by centrifugation at 8800 g for 10 min at 4 °C and washed twice by 0.85 % saline. Then, the concentration of cell suspension was adjusted to 50 mg wet cells/mL, and 10 mL cells suspension was filtered through polyvinylidene difluoride membrane (0.22 μm, 50 mm in diameter) under vacuum. For each strain, three biological replicates were performed and measured independently. The contact angle was measured in three phases: the bacterial lawn, n-tetradecane and a droplet of distilled water using a contact angle meter (Dataphysics, Germany). The fatty acid component analysis was performed as previously described [66, 67]. The fatty acid profile was assessed with Trace1310 GC equipped with TSQ8000 MSD (Thermo Fisher Scientific, Massachusetts, USA) and an HP-5MS methylpolysiloxane phase column (30 m × 0.25 mm × 0.25 μm). The GC conditions are as follows: the initial temperature of 60 °C for 2 min, 8 °C/min to 150 °C, then to 250 °C at a rate of 3 °C/min, finally at 10 °C/min to 280 °C and held for 5 min. Fatty acids and other volatile compounds were identified by mass spectral library search. Overexpression strains and control (JM109 carrying empty plasmid pQE80L) were cultured overnight and inoculated into fresh LBG medium (1 %, v/v). IPTG (0.2 mM) was added at 0.3 OD660, cells were further cultured for 8 h with or without 0.8 % n-butanol. The cell culture was centrifuged and the supernatant was subjected to HPLC analysis using Agilent 1260 (Palo Alto, USA) equipped with an Agilent Hi-Plex H PL1170-6830 column (7.7 × 300 mm, 8 µm) at 55 °C. 5 mM H2SO4 was used as an eluent at a flow rate of 0.6 mL/min. HS carried out the DNA microarray data analysis, solvent tolerant, membrane lipid analysis, cell surface hydrophobicity and quantification of metabolites, and drafted the manuscript. FZ carried out screening of σ70 mutants, DNA microarray sample preparation, transmission electron microscopy and participated in drafting the manuscript. AW carried out gene knockout/overexpression experiments and analyzed the data. RH participated in the design of the study, analyzed the data and helped to revise the manuscript. GX helped to design the experiments and revise the manuscript. YN conceived the study, designed and coordinated the experiments and critically revised the manuscript. All authors read and approved the final manuscript. We thank Mr. Kang Wu and Prof. Xiaodong Gao for help with the transmission electron micrographs and fluorescent micrograph analysis. The microarray data have been deposited at Gene Expression Omnibus (http://www.ncbi.nlm.nih.gov/geo/info/submission.html) under the accession number GSE79305. We are grateful to the National Natural Science Foundation of China (21276112, 31401634), Natural Science Foundation of Jiangsu Province (BK20150003, BK20140135), Fundamental Research Funds for the Central Universities (JUSRP51409B), the Program of Introducing Talents of Discipline to Universities (111-2-06) and a project funded by the Priority Academic Program Development of Jiangsu Higher Education Institutions for the financial support of this research. 13068_2016_527_MOESM1_ESM.docx Additional file 1: Fig. S1. Cell growth of σ70 mutants and WT in the presence of 1.2 % (v/v) n-butanol. All mutant strains were cultured in 24-well plates at 37 °C for 8 h, 1.2 % (v/v) n-butanol were added at 0.2 OD660. 13068_2016_527_MOESM2_ESM.docx Additional file 2: Fig. S2. Volcano plot of global gene expression differences between σ70 mutant B8 and WT upon butanol challenge. X axis: Log2 (Fold Change); Y axis: -Log10 (p-value). Green lines parallel to X axis represents p-value = 0.05. The left red zone denotes the number of down-regulated genes; the right red zone denotes the number of up-regulated genes (p < 0.05; FC ≥ 2). 13068_2016_527_MOESM3_ESM.docx Additional file 3: Table S3. Genes significantly changed (fold change ≥ 2, p-value < 0.05) in B8 vs control with 0.8 % (v/v) butanol treatment. 13068_2016_527_MOESM4_ESM.docx Additional file 4: Fig. S3. Transcription profile analysis of genes exhibiting significantly different expression levels in σ70 mutant B8 and WT. Hierarchical clustering using differentially expressed genes (probe sets) (p < 0.05; FC ≥ 2). Abscissa represents samples of B8 and WT, the ordinate represents different genes. Three biological replicates were performed. 13068_2016_527_MOESM5_ESM.docx Additional file 5: Fig. S4. 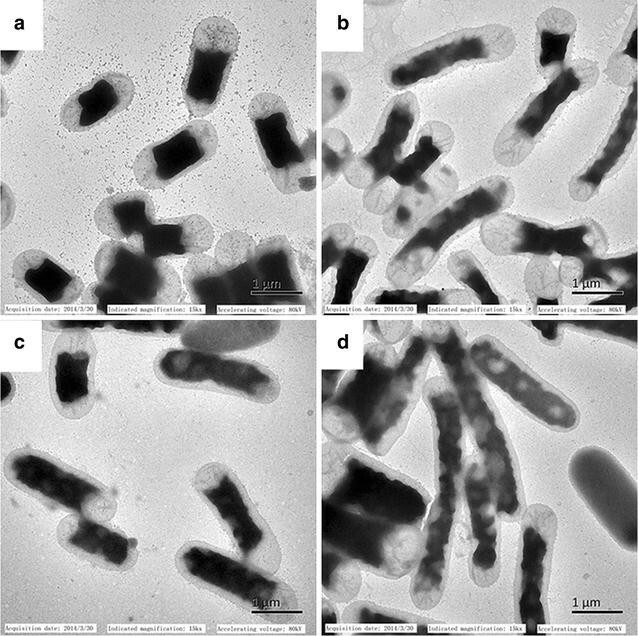 Analysis of surface hydrophobicity of E. coli knockout strains △yghW, △yibT and JM109 (control) by MATS. Three biological replicates were performed. 13068_2016_527_MOESM6_ESM.docx Additional file 6: Fig. S5. Contact angle measurement of E. coli knockout strains (A) JM109 (control), (B) △yghW, and (C) △yibT. Three biological replicates were performed. 13068_2016_527_MOESM7_ESM.docx Additional file 7: Fig. S6. Analysis of n-butanol tolerance of various gene overexpression strains with or without 0.8 % n-butanol. Strains were pre-cultured at 37 °C with addition of 0.2 mM IPTG at 0.3 OD660. Then 0.8 % (v/v) butanol was added at 0.8 OD660 for further incubation at 30 °C for 8 h. Three biological replicates were performed. 13068_2016_527_MOESM8_ESM.docx Additional file 8: Fig. S7. Pathways of glycolate metabolism and tricarboxylic acid cycle in Escherichia coli. 13068_2016_527_MOESM9_ESM.docx Additional file 9: Table S4. Pyruvate and fumarate levels in cell cultures of gcl and glcF overexpression strains with or without butanol. 13068_2016_527_MOESM10_ESM.docx Additional file 10: Table S1. Strains and plasmids used in this study. 13068_2016_527_MOESM11_ESM.docx Additional file 11: Table S2. Primes used in this study.